I’m writing for several reasons. I wanted to start out this letter by writing, “I’ve got some good news and I’ve got some bad news,” but I’ve decided against that particular opening. First of all, it works much better face to face, because I can make it more interactive, like, “What do you want first, the good news or the bad news?” and then you could decide, depending on whether or not you’d like the good news first, to build you up for the inevitable bad news. Or maybe you’d prefer to get the bad news out of the way, take that bitter medicine, and then take the good news to sort of chase down the negativity. Anyway, I’d like to point out that I’ve always been a Big League Chew fan. Ever since I was a little kid, I preferred your gum to other little kids’ chewing gums. I’ve never been a fan of Bubble Tape. Between you and me, although I’ve never busted out the tape measure, I’ve always been skeptical about there being a full six feet rolled up in that package. Bubble Yum? Bubbleicious? No thank you. I did flirt with switching to Skittles Gum as my go-to brand, but after the novelty of them tasting and having the same chew as Skittles candy wore off, I realized that it would be Big League Chew for life. Even if I didn’t get the reference when I was a little kid, that the pouch of gum was supposed to be shaped like a pouch of chewing tobacco, that the thin strands of gum were supposed to be similarly identical, it didn’t stop me from fully enjoying your product. 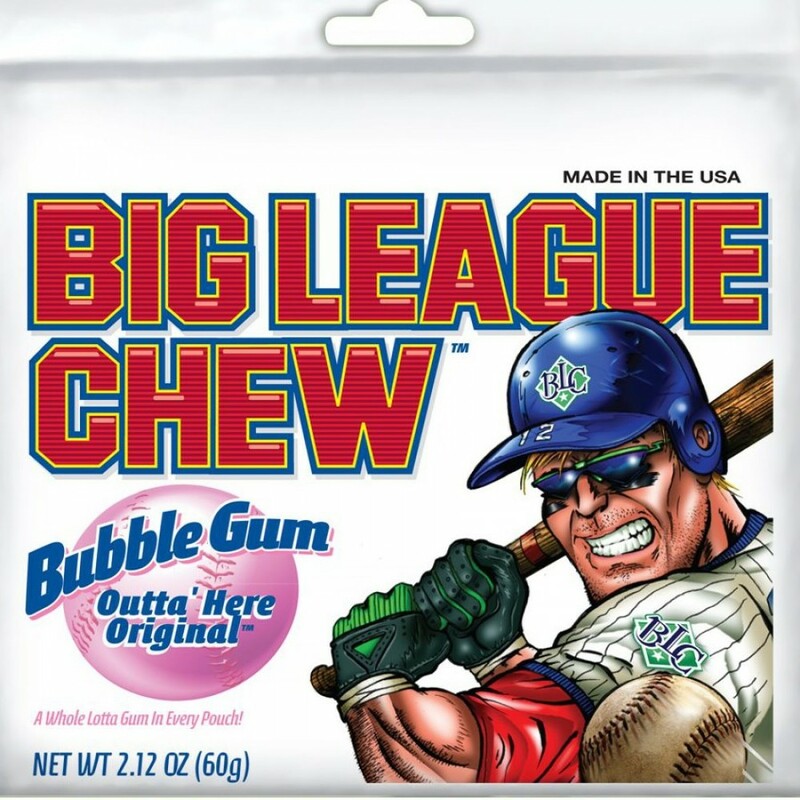 Whenever I watched a pro baseball player chewing something from a pouch, which, to be perfectly honest, I can’t really ever remember seeing, but maybe if I saw a movie or something where the pitcher was chewing some chew, I’d just assume it was Big League Chew. By not having individual pieces of gum, I’m free to choose exactly how much gum I want in my mouth at any given time. I’m not bound to individual sticks, having to decide between one or two. With Big League Chew, I can chew the equivalent of one and a half sticks, or one and three quarters sticks. It means more options for me, which I love. 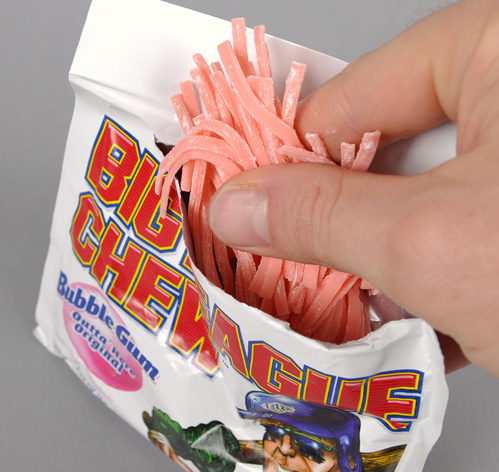 Unlike the other big gums, like the ones I’ve mentioned before, Big League Chew is definitely the chewiest. Nothing is worse than a big mouthful of gum that offers no resistance to your teeth. You’ll be chewing and chewing and it won’t stay in a cohesive wad. It’s totally unsatisfying, too liquid-like, too easy for stray pieces to get stuck in between the big molars in the back of your mouth. Big League Chew gets points from me in regards to flavor selection. I like how you guys keep it simple. Regular. Grape. One time I saw Green Apple, I think, although that might have been a dream. 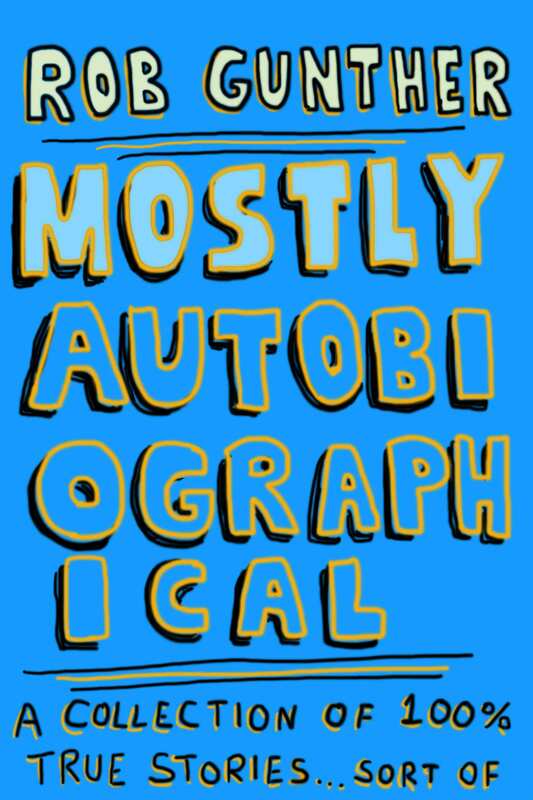 Regardless, it’s usually just regular. It makes the decision making process really easy, on my end. Having said all of that, I do have to mention some areas in which I think there’s definitely room for improvement. (Remember the whole good news/bad news thing? Yeah, so I gave you the good news first.) Where Big League Chew has the best chew, like I said before, I think you guys could work on taste. While the initial few chomps definitely pack a lot of flavor, I feel like the intensity of that flavor drops precipitously after a minute, a minute and a half. I’m not expecting it to last forever, but maybe three minutes, four minutes, that might be an improvement. Other than that, I just want to say, keep up the great work. I love Big League Chew to the point where I refuse to acknowledge any other chewing gums. In fact, I can’t even really chew anymore, because I’ve spent the majority of my life chewing Big League Chew. My jaw doesn’t close right, making chewing gum an impossibility. But I still buy it anyway. I’ll bring the pouch to my face and take deep breaths in. I’ll put some in my mouth and let the flavor just soak through my tongue. It’s still great. PS – One time I wrote to Pepperidge Farm telling them how much I love Milanos and they sent me a whole case of cookies. Any chance you’d like to up the ante? Let me know. 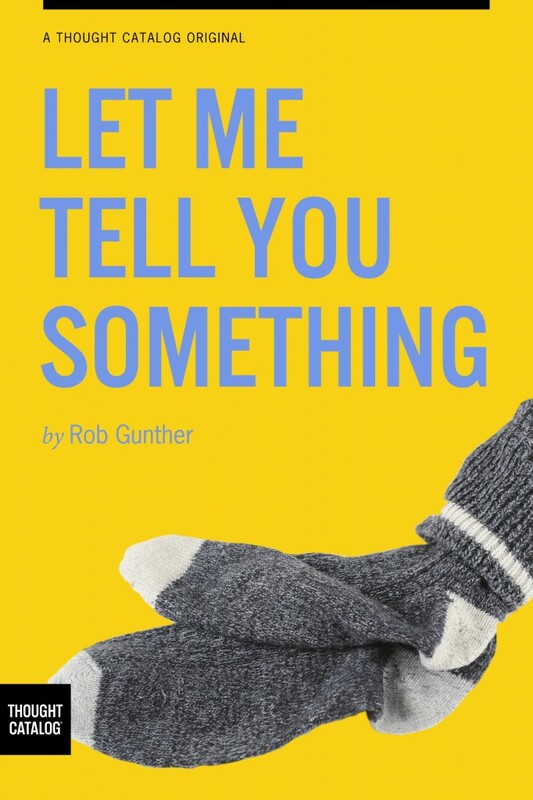 This entry was posted in Uncategorized and tagged baseball, Big League Chew, chewing gum, chewing tobacco, flavor, grape, open letter, Original, pouch on April 30, 2013 by Rob G..